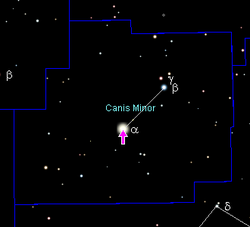 Elgomaisa, Algomeysa, Antecanis, α Canis Minoris, 10 Canis Minoris,GCTP 1805.00, HR 2943, BD+05°1739, HD 61421, LHS 233, GJ 280, HIP 37279, SAO 115756. ^ 5.0 5.1 Mermilliod, J.-C. Compilation of Eggen's UBV data, transformed to UBV (unpublished). Catalogue of Eggen's UBV data. 1986. Bibcode:1986EgUBV........0M. ^ Samus, N. N.; Durlevich, O. V.; 等. VizieR Online Data Catalog: General Catalogue of Variable Stars (Samus+ 2007–2013). VizieR On-line Data Catalog: B/gcvs. Originally published in: 2009yCat....102025S. 2009, 1: 02025. Bibcode:2009yCat....102025S. ^ Wilson, Ralph Elmer. General catalogue of stellar radial velocities. Washington. 1953. Bibcode:1953GCRV..C......0W. ^ 10.0 10.1 Giammichele, N.; Bergeron, P.; Dufour, P., Know Your Neighborhood: A Detailed Model Atmosphere Analysis of Nearby White Dwarfs, The Astrophysical Journal Supplement, April 2012, 199 (2): 29, Bibcode:2012ApJS..199...29G, arXiv:1202.5581, doi:10.1088/0067-0049/199/2/29 Age is for the white dwarf stage. ^ Schaaf 2008, p. 168. ^ IAU Working Group on Star Names (WGSN). [2016-05-22]. ^ Bulletin of the IAU Working Group on Star Names, No. 1 (PDF). [2016-07-28]. ^ Kelley, David H.; Milone, Eugene F.; Aveni, A.F. Exploring Ancient Skies: A Survey of Ancient and Cultural Astronomy. New York, New York: Springer. 2011: 217. ISBN 144197623X. ^ Cenev, Gjore. Macedonian Folk Constellations. Publications of the Astronomical Observatory of Belgrade. 2008, 85: 97–109. Bibcode:2008POBeo..85...97C. ^ Gingerich, O. Zoomorphic Astrolabes and the Introduction of Arabic Star Names into Europe. Annals of the New York Academy of Sciences. 1987, 500: 89–104. Bibcode:1987NYASA.500...89G. doi:10.1111/j.1749-6632.1987.tb37197.x. ^ Brosch, Noah. Sirius Matters. Springer. 2008: 46. ISBN 1-4020-8318-1. ^ MacDonald, John. The Arctic sky: Inuit astronomy, star lore, and legend. Toronto, Ontario/Iqaluit, NWT: Royal Ontario Museum/Nunavut Research Institute. 1998: 72, 231–33. ISBN 9780888544278. Schaaf, Fred. The Brightest Stars: Discovering the Universe through the Sky's Most Brilliant Stars. Hoboken, New Jersey: John Wiley & Sons. 2008. ISBN 978-0-471-70410-2.